In several communities around the world, Jews are at the forefront of the demographic changes that are taking place on a larger scale in the Western world. Low birth rates, combined with higher life expectancies, give predominance to the elderly in the Jewish age structure and open real questions about long-term demographic continuity. But if it is true that these changes are affecting the Jews, it is not less true that this is a wider phenomenon taking place in the Western world. How these transformations will impact in future societies is still unknown. In an effort to better understand these phenomena, JDC-ICCD interviewed Dr George Leeson, co-director of the Oxford Institute of population Ageing, who specializes in the socio-demographic impact of aging populations. “We are moving into a world that is increasingly populated by older people,” affirmed Dr Leeson, and added, “the 21st century could be well the last century of youth.” A sociologist and demographer at the University of Oxford, Dr Leeson is part of an academic team that aims to address through research, modeling and scenarios, the range of complex interactions between environmental and demographic change over the first half of the 21st century. 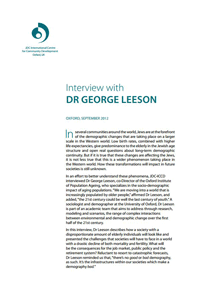 In this interview, Dr Leeson describes how a society with a disproportionate amount of elderly individuals will look like and presented the challenges that societies will have to face in a world with a drastic decline of both mortality and fertility. What will be the consequences for the job market, public policy and the retirement system? Reluctant to resort to catastrophic forecasts, Dr Leeson reminded us that, “there’s no good or bad demography, as such. It’s the infrastructures within our societies which make a demography bad”.